Your guests will be waiting for that unforgettable moment when you first enter the ballroom as a married couple. Take their breath away as a soft fog gives the room that dreamy feeling and attracts everyone’s attention for your Grand Entrance. 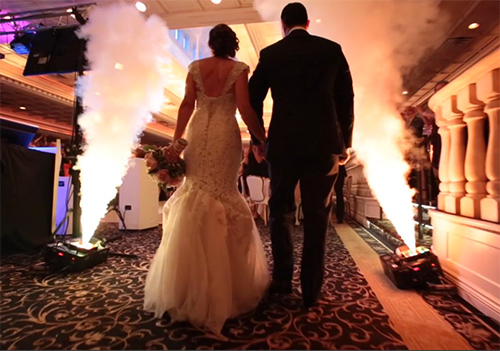 Your Wedding Entertainment Staff (Wedding DJ, MC and/or Light Jockey) will set up 2x Chauvet Geysers at the entranceway to send streams of illuminated fog into the air as you walk in. All eyes will be on you as you create this outstanding memory. Upon the booking the Grand Entrance Effect, please provide a floor plan of your venue that points out which door will be your entranceway into the ballroom. This will help us plan the best location for the Geysers. Also, please notify your Catering Hall, Photographer and Videographer of this effect so that they can be prepared for it.